[Lat.,=road conveyor], type of bridge for carrying a highway or railroad over a valley, over low ground, or over a road. It is commonly constructed in the form of several towers or piers that support arches on which the roadway rests. in engineering, term applied to a mass of reinforced concrete or masonry supporting a large structure, such as a bridge. When piers are built on ground of poor bearing value, it is often necessary to drive piles to obtain a firm base. ..... Click the link for more information. (intermediate supports) that were a great obstruction to river traffic, and their roadways were often lined with small shops. The best known early American design is the New England covered bridge, since wood was abundant and cheap, and did not demand trained masons. Colonial American bridge builders were willing to run the risk of rot or fire in exchange for such savings in time and manpower. Beginning with Abraham Darby's bridge at Coalbrookdale in 1779, most bridges began to be built of cast and wrought iron. Robert Stephenson, an English engineer, designed and built a bridge of this type across Menai Strait in North Wales (1850). Another is Victoria Bridge across the St. Lawrence at Montreal. The disadvantage of cast iron for bridges is its low tensile strength. , beam supported rigidly at one end to carry a load along the free arm or at the free end. A slanting beam fixed at the base is often used to support the free end, as in a common bracket. ..... Click the link for more information. bridge is formed by self-supporting arms anchored at and projecting toward one another from the ends; they meet in the middle of the span where they are connected together or support a third member. In a cable-stayed bridge, the roadway is supported by cables attached directly to the supporting tower or towers. This differs from a suspension bridge, where the roadway is suspended from vertical cables that are in turn attached to two or more main cables. These main cables hang from two towers and have their ends anchored in bedrock or concrete. ..... Click the link for more information. for converting cast iron into steel. It became possible to design framed structures with greater ease and flexibility. Single-piece, rolled steel beams can support spans of 50 to 100 ft (15–30 m), depending on the load. Larger, built-up beams are made for longer spans; a steel box-beam bridge with an 850-ft (260-m) span crosses the Rhine at Cologne. The truss can span even greater distances and carry heavy loads; it is therefore commonly used for railroad bridges. A large truss span like that over the Columbia River at Astoria, Oreg., can extend to 1,232 ft (376 m); the Ikitsuki Bridge, connecting Ikitsuki and Hirado islands in SW Japan, has a continuous-truss span of 1,312 ft (400 m), the longest in the world. If the truss is shaped into an arch, even longer bridges are possible; the Chaotianmen Bridge in Chongqing, China, the Lupu Bridge, Shanghai, China, the New River Bridge in West Virginia, the Bayonne Bridge between New York and New Jersey, and the Sydney Harbor Bridge in Australia have the longest steel arch spans, at 1,811 ft (552 m), 1,804 ft (550 m), 1,700 ft (518 m), 1,675 ft (510 m), and 1,670 ft (509 m), respectively. Concrete arch bridges tend to be somewhat smaller, the largest being the Wanxian Bridge in China and the Krk Bridge in Croatia at 1,378 ft (420 m) and 1,280 ft (390 m), respectively. The longest concrete arch bridge in the United States is the Natchez Trace Parkway Bridge in Franklin, Tenn., at 582 ft (177 m), although the concrete and steel O'Callaghan-Tillman Memorial Bridge, Nev.-Ariz., near Hoover Dam, has the largest concrete arch, at 1,079 ft (329 m). The cantilever, however, is more common for spans of such lengths. The cantilevered Forth Bridge (1890) in Scotland was the first major structure built entirely of steel, the material that made possible its two record-setting spans of 1,710 ft (521 m) each. They remained the longest in existence until 1917, when the St. Lawrence River at Quebec Bridge was built; it has an 1,800-ft (549-m) span. The longest cantilever bridge in the United States is the Commodore John Barry Bridge in Chester, Penn., which has an 1,644 ft (501 m) span. The cable-stayed bridge is the most modern type, coming into prominence during the 1950s. The longest is the Russky Bridge, Vladivostok, Russia, which has a main span of 3,622 ft (1,104 m); the Sutong Bridge, Suzhou–Nantong, Jiangsu, China, with a main span of 3,570 ft (1,088 m), and the Stonecutters Bridge, Hong Kong, with a main span of 3,340 ft (1,018 m) are other long cable-stayed bridges. The longest cable-stayed bridge in the United States is the Arthur Ravenel, Jr., Bridge in Charleston, S.C., which has a span of 1,546 ft (471 m). vehicular suspension bridge, New York City, southernmost of the bridges across the East River, between lower Manhattan and Brooklyn; built 1869–83. The achievement of J. A. Roebling and his son W. A. Roebling, it has a span of 1,595.5 ft (487 m). ..... Click the link for more information. across the East River (completed 1883), which was the world's longest suspension bridge at the time of its construction, having a main span of 1,595.5 ft (487 m). across the Golden Gate from San Francisco to Marin Co., W Calif.; built 1933–37. Its overall length is 9,266 ft (2,824 m); its main span across the strait, 4,200 ft (1,280 m), is one of the longest suspension bridges in the world. Joseph B.
vehicular suspension bridge across the Hudson River, between Manhattan borough of New York City and Fort Lee, N.J.; constructed 1927–31. It is one of the longest suspension bridges in the world. ..... Click the link for more information. , New York City, 3,500 ft (1,067 m); and the two Tacoma Narrows Bridges, Tacoma, Wash., 2,800 ft (853 m) each. 17.6 mi (28.2 km) long, across the mouth of Chesapeake Bay, E Va., connecting Cape Charles with Norfolk, Va.
Fr. Pont de la Confédération, bridge that joins Borden-Carleton in Prince Edward Island with Cape Jourimain in New Brunswick, Canada. Spanning the Northumberland Strait at its narrowest point, the bridge measures 8 mi (12. ..... Click the link for more information. , linking Prince Edward Island to the Canadian mainland, consists of three bridges. The longest cross-sea bridges are the Hangzhou Bay Bridge, 22.4 mi (36 km) long, which crosses the bay between Zhapu and Cixi, Zhejiang prov., China; the Donghai Bridge, 20.2 mi (32.5 km), which connects Shanghai, China, with the deepwater port on Yangshan Island in Hangzhou Bay; and the Jiaozhou Bay Bridge, 16.6 mi (26.7 km) long, which connects Qingdao with Huangdao, Shangdong prov., China; these bridges combine causeway with cable-stayed spans. The longest combination spans in the United States are the twin Lake Ponchartrain Causeways near New Orleans, Louisiana, whose parallel roadways stretch nearly 24 mi (38 km). Some viaducts carrying high-speed rail lines over land are even longer; the longest is the Danyang-Kunshan Grand Bridge, a 102.4-mi (164.8-km) viaduct in Jiangsu prov., China. Movable bridges are generally constructed over waterways where it is impossible or prohibitive to build a fixed bridge high enough for water traffic to pass under it. The most common types of movable bridge are the lifting, bascule, and swing bridges. The lifting bridge, or lift bridge, consists of a rigid frame carrying the road and resting abutments, over each of which rises a steel-frame tower. The center span, which in existing bridges is as long as 585 ft (178 m), is hoisted vertically. The bascule bridge follows the principle of the ancient drawbridge. It may be in one span or in two halves meeting at the center. It consists of a rigid structure mounted at the abutment on a horizontal shaft, about which it swings in a vertical arc. The lower center span of the famous Tower Bridge in London is of the double-leaf bascule type. Because of the need for large counterweights and the stress on hoisting machinery, bascule bridge spans are limited to about 250 ft (75 m). The swing bridge is usually mounted on a pier in midstream and swung parallel to the stream to allow water passage. See D. Plowden, The Spans of North America (1984); H. Petroski, Engineers of Dreams: Great Bridge Builders and the Spanning of America (1995); J. Dupré and F. O. Geary, Bridges: A History of the World's Most Famous and Important Spans (1996); S. A. Ostrow, Bridges (1997); F. Gottemoeller, Bridgescape: The Art of Designing Bridges (1998); K. Willard, Bridges: Designing the Future (1999). See also bibliographies for articles on individual bridges. card game for four players, those on opposite sides of the table being partners. The full pack of 52 cards is dealt. The dealer's last card is turned up to indicate trump, and after he draws this card in hand, the player on the left of the dealer leads. ..... Click the link for more information. , played with 52 cards by four players in two partnerships. The cards in contract bridge rank from ace down to two; in bidding, suits rank spades, hearts, diamonds, and clubs. After all cards are dealt, so that each player holds 13 cards, the dealer begins the auction, which proceeds in rotation to the left. Each player must bid, pass, double (increase the value of the previously stated contract), or redouble (only after a double, further increasing the point value of the contract). A bid is an offer to win a stated number (over six) of tricks with a named suit as trump or with no trump. The lowest bid is one, the highest seven. Each bid, i.e., "one diamond," "one no-trump," "four hearts," must be higher than the preceding bid, with no-trump ranking above spades. Artificial bids are those that convey certain information to a partner and are not meant to be taken literally. The highest bid of the auction becomes the contract after three consecutive passes end the bidding. The player who first named the suit (or no-trump) specified in the winning bid becomes the declarer. The player to the left of the declarer leads any card face up, and the next hand, that of the declarer's partner, is placed face up on the table, grouped in suits. This is known as the dummy, and the declarer selects the cards to be played from this hand. The object of the game for both partnerships is to win as many tricks as possible, a trick being the three cards played in rotation after the lead. Suits must be followed, but a player who has no cards in the suit led may play any card. Highest trump or, if no trump card is played, highest card of the suit led wins. Points are awarded for the number of tricks won. Numerous conventions—generally accepted forms of bidding—are used in bridge, but the four standard ones are Blackwood, Gerber, Stayman, and grand-slam force. Duplicate bridge, in which the same prearranged hands are played by individuals, pairs, or teams of four, is the main form of competitive bridge. The laws of contract bridge are promulgated in the Western Hemisphere by the American Contract Bridge League, which holds various bridge tournaments. In international contract bridge matches the Bermuda bowl, the trophy for victory, is the emblem of the world championship. In Olympic years an olympiad championship is held by the World Bridge Federation and replaces the team tournament for the Bermuda bowl. , 1891–1955, American authority on contract bridge, b. Romania. His father was an American engineer then living in Romania, and his mother was of Russian parentage. ..... Click the link for more information. . The craze subsided but was later revived; books, tournaments, and newspaper columns on bridge abound. Culbertson devised the honor count system to evaluate a hand for bidding. The point count (or standard American) system introduced by Charles H. Goren in the 1940s has generally replaced honor count. See C. H. Goren, Bridge Complete (rev. ed. 1971); T. Reese and A. Dormer, The Complete Book of Bridge (1974). A structure that spans a depression or provides a passage between two points at a height above the ground: affording passage for pedestrians and vehicles. A drawbridge with one or two balanced leaves that pivot vertically on a trunion located at one end of the span. At the entrance to fortifications, a bridge over the moat or ditch, hinged and provided with a raising and lowering mechanism so as to hinder or permit passage. A narrow bridge structure that is designed to carry pedestrians only. A lightweight structural covering over a sidewalk to protect pedestrians from construction or cleaning of the structures overhead. A walkway that is located over the ground level and the street; and often connects buildings across a street. A bridge hung from cables that are strung between two towers or a tower and abutment. A bridge that opens by turning horizontally on a turntable supported on a pier. a structure that provides a path over an obstacle. Bridges are classified according to the type of obstacle—bridges across rivers and other watercourses (bridges proper), across roads (overpasses), and across gullies and ravines (viaducts and trestles); according to the function of the path—railroad bridges, highway bridges, municipal bridges, footbridges, and bridges for integrated traffic, for the passage of water-ways (canal bridges), for water supply (aqueducts), and for gas and petroleum pipes; and according to the material of the main components—wooden, masonry, reinforced-concrete, and steel bridges. The cost of erecting bridges accounts for up to 15 percent of the total construction cost of a road; on modern high-speed highways it is even higher. There are special requirements for the strength, safety, and durability of bridges. In addition, the design of a bridge should meet the requirements of industrial fabrication and mechanized erection, thus assuring rapid construction and high-quality workmanship. Bridges usually consist of spans and piers. A vehicle roadway, as well as footways and pipelines, is laid on the bridge span. A distinction is made between river spans (over the navigable part of a river) and shore spans (over the remaining part). The roadway of a span may be below or above the supporting structure, as well as in the middle. The intermediate supports for a bridge are called piers, and the end supports are called abutments. The latter join the bridge to the embankments of the approaches. The loads on the span are transmitted to the piers through bearing parts. Other bridge systems are known, such as the frame type, in which the span and pier are a single unit (in such cases no bearing parts are installed). The principal dimensions of a bridge (see Figure 1) are the total length L; the effective spans l1, l2, and l3 of the span structures, as measured between the centers of the support points; the internal widths l01, l02, and l03 of the piers; and the width of the roadway and sidewalks. The position of the structures with respect to height is described by marks (heights above an arbitrary horizon) for the roadway level R, the low-water level LW, the high-water level HW, and the base of the pier foundations F. The length of a bridge across a watercourse depends on its aperture, which is the sum of the internal widths between the piers minus the embankment cones. The aperture is found from hydraulic computations. m (including the catwalks). On a highway bridge the width of the roadway is set according to the number of traffic lanes (the width of a lane is 3.5–3.75 m). A distinction is made among girder, arch, frame, suspension, guy, and combination bridges, depending on the basic design. A special group is formed by floating bridges, drawbridges, and prefabricated bridges. Girder bridges have spans with a supporting structure in the form of continuous beams (girders) or through trusses, which may be simple (continuous; Figure 2, a) or cantilevered, with ends (cantilevers) that extend to adjacent spans by and are connected by hinges to simple beams suspended from the spans (Figure 2,b). Continuous (through) beams are more complicated in design than simple beams, but they are more economical and provide a smoother contour for the bridge roadway, which is especially important for high-speed traffic. Arch bridges (Figure 2,c) require smaller consumption of materials for spans than do girder bridges. On the other hand, their piers must be designed to withstand horizontal forces, and therefore the cost of their construction is usually higher. If a tie beam is used (Figure 2,d), the piers are relieved of the thrust effect, but in this case the expenditures for the span structure are increased. mounted on the ends of the collar beams (suspension-frame bridges, Figure 2,f). Suspension bridges (Figure 2,g) are similar in function to arch bridges, but the load-bearing elements are under tension and are convex downward, so that the thrust acts on the piers toward the center of the span. Guy bridges (Figure 2,h) closely resemble suspension bridges in design. The load-bearing structures of combined systems blend elements of various types of bridges (for example, girder and arch bridges). History. The construction of major bridges began in the era of the slaveholding society. Many stone and wooden bridges and aqueducts were constructed in ancient Rome, which had developed a network of roads totaling about 75, 000 km. The stone bridges that have been partially preserved have solid, largely semicircular, arches with small spans, and piers one-third to one-half of the span in width. Light wooden bridges on piles, as well as floating bridges, were also built; the latter were frequently used for military purposes. During the Middle Ages the development of cities and the expansion of commerce necessitated the construction of many bridges; several unique masonry bridges of that period have substantial spans, smoother arches, and narrower supports (for example, the bridge across the Adda River in Trezzo, Italy, with a span of 72.25 m). Bridges have been known in Russia since antiquity. The Tales of Bygone Years tells of bridge-building in the mid-tenth century. A floating bridge across the Dnieper at Kiev is mentioned in the chronicle (1115). Wooden girder bridges on piers consisting of log frameworks filled with stone (cribs) were also constructed. There was extensive bridge-building (mainly masonry) in Armenia and Georgia. In the 16th and 17th centuries, both land and water communications developed. Bridges with large spans were required for the passage of ships. In the 18th century the span of wooden bridges on masonry piers reached 119 m (the bridge across the Limmat River in Germany). An outstanding achievement of the time was a wooden arch bridge across the Neva River, with a span of 298 m, designed by the talented self-educated Russian I. P. Kulibin. Beginning in the late 18th century, metal was used in bridge construction. The first metal (cast iron) bridge was built in Great Britain across the Severn River in 1779. It had a span of about 30 m, which was covered by cast iron arches. Cast iron arch bridges became commonplace in other countries, including Russia. Such a bridge (now the Lieutenant Shmidt Bridge) was erected in St. Petersburg in 1850 by the Russian engineer S. V. Kerbedz; it had seven spans, 45–47 m each. Several large suspension bridges (with iron chains), with spans of up to 265 m, were erected in the first half of the 19th century. However, owing to imperfect design and inadequate rigidity, many bridges collapsed because of the action of the wind or the increased vibration amplitudes during the passage of large numbers of people marching in step (the resonance phenomenon). In the mid-19th century the erection of steel girder bridges began. One of the first was the Britannia Railroad Bridge, constructed in Great Britain by the engineer R. Stephenson. Its spans were continuous tubular beams, 70 and 140 m long. The first attempts at analysis and testing of bridges with models during design and construction were made in this period. A theory of bridge design was developed. Of great importance was the research of the Russian engineer D. I. Zhuravskii, who developed methods of calculating girder frames and beams for transverse forces and who built several major bridges on the St. Petersburg-Moscow railroad. The steel bridge with girder spans, frequently using through trusses for medium and large spans, became the principal type in the second half of the 19th century. The Russian school of bridge-building—and, in particular, professors N. A. Beleliub-skii and L. D. Proskuriakov—performed a great service in the development of new designs and forms of spans and in the improvement of their calculations. The bridge across the Volga at Syzran’, constructed between 1875 and 1881 according to a design by Beleliubskii, was 1, 443 m long (13 spans of 111 m each) and was the largest in Europe at that time. In the 20th century the growth of industrial production and advances in construction work brought about the further development of bridge-building; the lengths covered by steel spans increased substantially. Among the large structures erected were a cantilever girder bridge across the St. Lawrence River in Quebec, Canada (1917), with a span of 549 m, and the arch bridge across the Kill van Kull in New York (1931), with a span of 503.8 m. In 1937 a suspension bridge with a main span of 1, 280 m was built across the Golden Gate in San Francisco. Large metal bridges have been built in the USSR across the Volga at Gorky and Saratov (1935) and across the Dnieper at Zaporozh’e (according to the plans of N. S. Streletskii). Through the efforts of E. O. Paton, the use of automatic welding for the fabrication and erection of span structures is becoming increasingly widespread. Reinforced-concrete bridges became very common in the early 20th century. Reinforced concrete was used mainly for girder spans of up to 50 m and for larger arch spans (more than 250 m). In the 1930’s a number of unique arch bridges were erected in the USSR using cast reinforced concrete (for example, the bridge across the Moskva River at Voskresensk, the Volodarskii Bridge across the Neva River in Leningrad, and the Moskvoretskii Bridge in Moscow). The use of prefabricated reinforced-concrete units was begun in the early 1940’s. After the Great Patriotic War several long-span reinforced-concrete arch bridges were built, including one across the Dnieper with a span of 228 m. In the USSR, valuable contributions to the science and practice of bridge-building were made by G. P. Perederii, Streletskii, G. K. Evgrafov, and E. E. Gibshman; contributions abroad were made by E. Freyssinet, F. Leonhardt, R. Maillart, and R. Morandi. Structural configurations of modern bridges. In contemporary bridge-building the principal structural members of metal bridges are made from mild and low-alloy steels; aluminum alloys are sometimes used. Solid metal beams of the same or different heights are usually used for the construction of metal railroad bridges with spans of up to 80 m and highway bridges with spans of up to 300 m. The main beams are interconnected by means of couplings. A reinforced-concrete slab for the roadway is placed over the beams. The slab is joined by special supports to the main metal beams, thus providing for their joint functioning and, as a result, reducing the quantity of metal in the structure (such bridges are called steel reinforced-concrete types; see Figure 3). Box-type main beams made of steel sheets reinforced internally by longitudinal ribs and transverse plates are also used. The slab for the roadway on such beams is made of reinforced concrete or metal. Such spans are economical, light, and rigid, which makes possible their use for large spans (up to 300 m). Metal span structures in the form of through trusses are used for the largest spans (more than 500 m). Through trusses are more economical than solid beams but are more difficult to fabricate and assemble. For the construction of a railroad track or motor-vehicle road, longitudinal and transverse beams are laid down between the trusses for the roadway, and a reinforced-concrete slab or rails are laid on the beams. Metal arch bridges are constructed to cover spans of up to 500 m (if the foundation soils are solid). They are usually built in mountainous areas. One of the largest arch bridges crosses the Vltava River in Czechoslovakia (1967) and has a span of about 320 m.
Suspension bridges are built to cover spans exceeding 1, 000 m (for example, when crossing the mouths of deep rivers, bays, and straits, where the construction of a great number of piers is complicated and uneconomical). The cables of such bridges are made of high-strength steel wires arranged in parallel or twisted into a rope. The towers of a suspension bridge are usually box-type and made of metal; they are sometimes made from reinforced concrete. The Verrazano-Narrows Bridge (USA, 1964) has the longest span (1, 298 m). Guy bridges are becoming more common for spans of 150–350 m. The guys that support the stiffening girder may converge at the peak of the tower or run parallel to one another. Asymmetrical single-tower arrangements are in use (a bridge across the Rhine River at Cologne, 1959). The stiffening I-beams or box beams of suspension and guy bridges are kept level by hangers or guys. For large spans (more than 500 m), the main beams are replaced by through trusses. Reinforced-concrete bridges are divided into cast and prefabricated types. Cast bridges are poured at the construction site; prefabricated bridges are assembled from separate components that are made in special plants for reinforced-concrete structural members or at on-site areas. Reinforced-concrete girder bridges usually have a slab for the roadway and sidewalks, as well as crossbeams (plates) and main beams. The roadway slab forms part of the main beams. In the USSR extensive use is made of spans prefabricated from separate beams that cover the entire span and are interconnected by poured seams in the roadway and plate slabs and by welded metal insertion elements. If the beam reinforcement is prestressed, the beams can be divided lengthwise into individual blocks, which are delivered to the construction site from the plants. The tensioned reinforcement squeezes the blocks together, forming a beam. Solid reinforced-concrete cantilever and frame bridges with spans of 50–200 m have become widespread. The main beams of such bridges are usually box-type beams. The most efficient means of cantilever-type construction of bridges are the frame-suspension and cantilever-frame systems, because tension for the collar beams of T-shaped frames, both during assembly and in use, arises at the upper edge, and reinforcement is needed only at the top. For continuous beams, bottom reinforcement is also necessary, which greatly complicates the work. On the other hand, there are no discontinuities in the contour of continuous beams; therefore, there has been a notable tendency toward more extensive use of continuous beams in modern bridges. In bridge-building practice there are examples of reinforced-concrete bridges with spans in the form of through trusses. However, the complexity of connecting the reinforced-concrete elements at the truss joints restricts their use. Reinforced-concrete arch bridges with solid or free-standing arches are used for spans from 50–60 m to 200–300 m. In the USSR arch bridges are usually made from prefabricated reinforced concrete. Arch-cantilever bridges in which two half-arches are joined at the top by tie beams to form a T-shaped frame are also built. A number of large bridges have been built using this system (for example, the subway bridge in Kiev). As motor-vehicle transportation develops, complicated, multitiered bridge-type structures are being built on highways, particularly in the cities; they curve both vertically and horizontally and consist of reinforced-concrete or steel trestles and overpasses. The curvilinear spans frequently have a box-shaped cross section. The piers of modern metal and reinforced-concrete bridges are usually made of light cast concrete or prefabricated reinforced concrete on a natural or pile foundation. Construction. The installation of piers is the most time-consuming, labor-intensive, and costly process in the construction of a bridge (up to 50 percent of the total cost). The hydrogeological conditions determine whether the piers are constructed in open excavations or by driving piles, massive cofferdams, caissons, and prefabricated reinforced-concrete casings. For the piers of small and medium bridges in modern construction, extensive use is made of reinforced-concrete piles, which are driven into the ground by steam, diesel, or electric vibratory pile drivers; for the construction of large bridges, tubular prefabricated reinforced-concrete shells up to 3 m in diameter are sunk by vibration pile driving or drilling. Spans are usually erected by methods that avoid the construction of continuous falsework in river beds. Small and medium spans or large portions of them are hoisted into position on the piers by erecting cranes with a lifting capacity of up to 130 tons. For larger spans, the span is assembled on shore and then transported or floated on pontoons and placed on the piers. The most common method of bridge erection is the cantilever type, in which the structure is built out from the piers across the span. Metal spans are assembled by a crane that moves along the finished portion; the bridge elements move under the crane along a track on the assembled span. For reinforced-concrete spans, the cantilever-type method of assembly (developed in the USSR) includes the fabrication of the individual structural elements (units) at a plant and their delivery to the assembly site (usually by water) and placement in the desired location by special cranes. The joints between blocks are filled with cement mortar; adhesive joints between blocks are also used. Blocks are frequently joined by locking beams that are installed with the same cranes. Outside the USSR, the cantilever-type concreting method is used in addition to cantilever-type assembly: a sliding casing is suspended from the completed portion of a structure, the span portion is concreted, and the reinforcement is tensioned after the concrete has set. The erection of suspension bridges begins with the towers, and then temporary cables are hung and used to lay up the main cables. The final step is installation of the hangers and a stiffening beam. Construction in the USSR is carried out by specialized organizations (bridge-building teams, trains, and mobile task forces), which are provided with equipment, mechanisms, cranes with a large lifting capacity, and stock auxiliary structural members. Bridges are usually constructed by industrial methods; only prefabricated structures are assembled at the site. All new bridges undergo tests (for temporary, moving loads), which are conducted by specialized bridge-testing stations. Calculations. Calculations for bridges are performed mainly by the method of limiting states. Each portion of a bridge (the spans and the supports) must satisfy requirements for strength, deflection, and crack resistance under the most unfavorable combination of loads on the structure. Two kinds of loads act on a bridge: constant loads (the weight of the bridge itself and the preliminary stress on the reinforcement) and temporary loads (the weight of railroad trains or columns of motor vehicles and crowds of people on the sidewalks, tracked or wheeled live loads, wind and ice pressure, collisions of ships with the piers, impacts of traffic on the rails or sidewalks, and the forces produced by sudden braking). In seismic areas, an allowance is made for the inertia loads that arise during earthquakes. All load calculations are standardized with regard to the existing traffic load and the prospects for its increase. Methods of bridge design are based on achievements in mathematics, structural mechanics, the theory of strength of materials, and other sciences. Electronic computers are used extensively for calculations. Trends in the development of bridge-building. The modern trend in bridge-building is characterized by increased use of prefabricated components and factory-made parts, the introduction of industrial production and operating methods, and the mechanization of the basic technological processes, along with the further development of structural systems for bridges and an increase in their maximum span. The use of high-strength steels and light alloys and the use of welding instead of riveting is increasing in bridge construction; the structural shape of spans is being improved through the use of rigid box-type sheet components. In reinforced-concrete bridge-building the use of thin-wall components made of high-strength concrete is acquiring increasing importance, as are the standardization of the prefabricated elements for spans and piers, the creation of new types of prestressed components, and the development of standard casings and erecting units. Nadezhin, B. M. Mosty i puteprovody v gorodakh. Moscow, 1964. Gibshman, E. E. Proektirovanie dereviannykh mostov. Moscow, 1965. Gibshman, E. E. Proektirovanie metallicheskikh mostov. Moscow, 1969. Evgrafov, G. K. , and N. N. Bogdanov. Proektirovanie mostov. Moscow, 1966. II’iasevich, S. A. Metallicheskie korobchatye mosty. Moscow, 1970. Nazarenko, B. P. Zhelezobetonnye mosty, 2nd ed. Moscow, 1970. Architecture. Many bridges are outstanding monuments to architecture and engineering skill. In masonry bridges, the most common type of bridge until the second half of the 19th century, the massive abutments and spans, which necessitated large quantities of construction materials, visually embodied the concepts of stability, strength, and reliability. A union of architecture and engineering skill was achieved in the bridges of ancient Rome. The expressive architectonics of the massive, multiple-arch construction, almost devoid of decoration, imparts to the bridge a sense of stark power, which is characteristic of the utilitarian edifices of ancient Rome (the Alcántara bridge across the ravine of the Tagus River in Spain, A.D. 98–106, builder Gaius Julius Lacer). In metal bridge components, maximum use is made of the mechanical and physical properties of the material (metal withstands tensile forces well). Because of this quality, metal bridges became less massive than masonry bridges and acquired a more delicate outline, which is an important artistic feature (the bridge across the Douro River at Porto, Portugal, 1881–85, engineer A. G. Eiffel). Metal bridges with efficient engineering and architectural treatments have affected the architectural styles of the 20th century. Reinforced-concrete bridges are sculpturally expressive. The dynamism and visual lightness of form often impart a singular elegance to large structures (the bridge across the Arve River in Switzerland, 1936; engineer R. Maillart). The substantial dimensions, large shapes, and distinctive outline of bridges influence the architectural aspect of a city (for example, bridges in Leningrad, Prague, and Budapest). Therefore, the structural and architectural-spatial treatment of a municipal bridge must take into account the specific conditions of its location and the natural and architectural environment. A particularly important and complicated urban-planning problem is the search for a harmonious combination of the outline, scale, and structural design of a bridge with the long-established buildings of old cities that are often valuable from a historical and artistic standpoint. An example of a successful solution is the Alexander Nevsky bridge across the Neva River in Leningrad (1965, engineers A. S. Evdonin and others, architects Iu. I. Sinitsa and others). By repeating the outline of the other Neva bridges over the water, it is made commensurate with the scale of the river and the buildings on its esplanades. an electrical device used to measure resistance, capacitance, inductance, and other electrical quantities. It consists of a bridge circuit, whose operation is based on comparison of the quantity being measured with a standard value of the quantity. The comparison method yields very accurate results; therefore, bridges are widely used in laboratories and industrial practice. The simplest type of DC bridge, used in measuring effective (ohmic) resistance, is shown in Figure 1. The supply voltage (current) is connected to the input terminals A and B (on the supply diagonal). A null indicator or measuring instrument is connected to the output terminals C and D (on the measuring diagonal). By adjusting one or more variable resistors, the potentials at the points C and D can be made equal. Equilibrium is achieved when the null indicator shows no current flowing through the measuring diagonal (that is, the bridge is balanced). For the balanced condition of a bridge, the ratio of the resistances of the arms is given by the equation R1·R4 = R2·R3 (the equilibrium condition). To measure a resistance Rx, it is connected in one arm of the bridge—for example, as the resistance R1, If the bridge is balanced, Rx = (R2 · R3)/R4. In this method the accuracy of measurement of Rx is determined by the precision of the calibrated resistances R2, R3, and R4 and by the sensitivity of the null indicator. The Wheatstone (four-arm) bridge shown in Figure 1 is commonly used for measuring resistances R≧1 ohm (Ω). The results of measurement of resistances R < 1 Ω with a Wheat-stone bridge are significantly affected by the resistances of the connecting leads and by contact resistances, since they are becoming commensurate with Rx. To measure resistances from 1 microhm (μΩ) to 1 Ω, double or multiarm bridges are used. Combined single and double bridges exist that are capable of measuring resistances from 1 μ to 1 Ω with an error of the order of ± 0.002 percent. Sometimes the resistances are not varied, and the results of measurement are recorded by an instrument calibrated in units of the quantity being measured and connected to the measuring diagonal; this is called the unbalanced-bridge method. Balanced AC bridges are used to measure capacitance, inductance, coefficient of mutual inductance, and so on. The results of measurement of such quantities depend on the frequency of the voltage supplied to the bridge; therefore, measurements are usually made at some specified constant frequency. The basic circuit of an AC bridge is similar to the one shown in Figure 1, with the difference that each arm may contain an inductance coil, a capacitor, and a resistor. An AC bridge is usually balanced by adjusting two components rather than one, since the balancing of such a bridge depends on the ratio of the impedances of its arms, which in the presence of capacitances and inductances are complex quantities. The magnitudes of the quantities being measured are determined from the conditions of balancing of the bridge. Measuring generators operating at audio frequency are the most common source of alternating current for AC bridges. Industrial alternating current (50 hertz) is used less frequently. 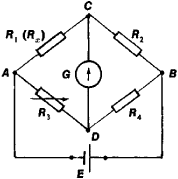 A moving-coil galvanometer is used as the null indicator for a DC bridge; vibration galvanometers, telephones, electronic pointer indicators, or electron-beam instruments are used for AC bridges. In modern bridges the balancing process is automated, and the results of a measurement are displayed as a number on a readout device. Such instruments are called digital bridges. Gorodovskii, A. F. Mosty postoiannogo toka. Moscow-Leningrad, 1964. Nizhnii, S. M. Mosty peremennogo toka. Moscow-Leningrad, 1966. Shkurin, G. P. Spravochnik po elektro- i elektronno-izmeritel’nym priboram. Moscow, 1972.
of a ship. (1) Navigational, or captain’s, bridge, an elevated superstructure on the upper deck of a ship that provides an all-around view; it houses the equipment and instruments required to run the ship, as well as facilities for visual or acoustic signals. (2) Fore-and-aft bridge (gangway), constructed to run lengthwise above the upper deck of a ship (usually a tanker) to connect the ship’s superstructures. It permits the crew to move about safely during a storm. What does it mean when you dream about a bridge? Bridges often indicate literal travel. They also frequently represent life transitions. Because bodies of water symbolize the subconscious as well as the emotions, a bridge may indicate a structure that keeps one from falling into one’s subconscious or into one’s emotions (as in “bridge over troubled water”). Bridges are also links between two otherwise separated shores. Any one of these connotations might be indicated, and thus bridge images must be interpreted in the larger context of the dream. A structure erected to span natural or artificial obstacles, such as rivers, highways, or railroads, and supporting a footpath or roadway for pedestrian, highway, or railroad traffic. A device that joins two networks of the same type. An electrical instrument having four or more branches, by means of which one or more of the electrical constants of an unknown component may be measured. A line whose removal disconnects a component of a graph. Also known as isthmus. A piece of timber held above the cap of a set by blocks and used to facilitate the driving of spiling in soft or running ground. A connection between two different parts of a molecule consisting of a valence bond, an atom, or an unbranched chain of atoms. An obstruction in a borehole resulting from the wall caving or the presence of a large boulder. A device installed in a borehole either permanently or temporarily to retain cement or other material. A structure built to provide ready passage over natural or artificial obstacles, or under another passageway. Bridges serve highways, railways, canals, aqueducts, utility pipelines, and pedestrian walkways. In many jurisdictions, bridges are defined as those structures spanning an arbitrary minimum distance, generally about 10–20 ft (3–6 m); shorter structures are classified as culverts or tunnels. In addition, natural formations eroded into bridgelike form are often called bridges. This article covers only bridges providing conventional transportation passageways. Bridges generally are considered to be composed of three separate parts: substructure, superstructure, and deck. The substructure or foundation of a bridge consists of the piers and abutments which carry the superimposed load of the superstructure to the underlying soil or rock. The superstructure is that portion of a bridge or trestle lying above the piers and abutments. The deck or flooring is supported on the bridge superstructure; it carries and is in direct contact with the traffic for which passage is provided. Bridges are classified in several ways. Thus, according to the use they serve, they may be termed railway, highway, canal, aqueduct, utility pipeline, or pedestrian bridges. If they are classified by the materials of which they are constructed (principally the superstructure), they are called steel, concrete, timber, stone, or aluminum bridges. Deck bridges carry the deck on the very top of the superstructure. Through bridges carry the deck within the superstructure. The type of structural action is denoted by the application of terms such as truss, arch, suspension, stringer or girder, stayed-girder, composite construction, hybrid girder, continuous, cantilever, or orthotropic (steel deck plate). The two most general classifications are the fixed and the movable. In the former, the horizontal and vertical alignment of the bridge are permanent; in the latter, either the horizontal or vertical alignment is such that it can be readily changed to permit the passage beneath the bridge of traffic. Movable bridges are sometimes called drawbridges in an anachronistic reference to an obsolete type of movable bridge spanning the moats of castles. A singular type of bridge is the floating or pontoon bridge, which can be a movable bridge if it is designed so that a portion of it can be moved to permit the passage of water traffic. The term trestle is used to describe a series of short spans supported by braced towers, and the term viaduct is used to describe a high structure of short spans, often of arch construction. This type of construction is selected when the vertical clearance provided beneath the bridge exceeds the clearance required by the traffic it spans. For very short spans, construction may be a solid slab or a number of beams; for longer spans, the choice may be girders or trusses. Still longer spans may dictate the use of arch construction, and if the spans are even longer, stayed-girder bridges are used. Suspension bridges are used for the longest spans. Beam bridges consist of a series of beams, usually of rolled steel, supporting the roadway directly on their top flanges. The beams are placed parallel to traffic and extend from abutment to abutment. Plate-girder bridges are used for longer spans than can be practically traversed with a beam bridge. In its simplest form, the plate girder consists of two flange plates welded to a web plate, the whole having the shape of an I. Box-girder bridges have steel girders fabricated by welding four plates into a box section. A conventional floor beam and stringer can be used on box-girder bridges, but the more economical arrangement is to widen the top flange plate of the box so that it serves as the deck. When this is done, the plate is stiffened to desired rigidity by closely spaced bar stiffeners or by corrugated or honeycomb-type plates. These stiffened decks, which double as the top flange of the box girders, are termed orthotropic. The wearing surface on such bridges is usually a relatively thin layer of asphalt. Truss bridges, consisting of members vertically arranged in a triangular pattern, can be used when the crossing is too long to be spanned economically by simple plate girders. Where there is sufficient clearance underneath the bridge, the deck bridge is more economical than the through bridge because the trusses can be placed closer together, reducing the span of the floor beams. The continuous bridge is a structure supported at three or more points and capable of resisting bending and shearing forces at all sections throughout its length. The bending forces in the center of the span are reduced by the bending forces acting oppositely at the piers. Trusses, plate girders, and box girders can be made continuous. The advantages of a continuous bridge over a simple-span bridge (that is, one that does not extend beyond its two supports) are economy of material, convenience of erection (without need for falsework), and increased rigidity under traffic. The disadvantages are its sensitivity to relative change in the levels of supporting piers, the difficulty of constructing the bridge to make it function as it is supposed to, and the occurrence of large movements at one location due to thermal changes. The cantilever bridge consists of two spans projecting toward each other and joined at their ends by a suspended simple span. The projecting spans are known as cantilever arms, and these, plus the suspended span, constitute the main span. The cantilever arms also extend back to shore, and the section from shore to the piers offshore is termed the anchor span. Trusses, plate girders, and box girders can be built as cantilever bridges. The chief advantages of the cantilever design are the saving in material and ease of erection of the main span. The cable-stayed bridge, a modification of the cantilever bridge which has come into modern use, resembles a suspension bridge. It consists of girders or trusses cantilevering both ways from a central tower and supported by inclined cables attached to the tower at the top or sometimes at several levels. The suspension bridge is a structure consisting of either a roadway or a truss suspended from two cables which pass over two towers and are anchored by backstays to a firm foundation. If the roadway is attached directly to the cables by suspenders, the structure lacks rigidity, with the result that wind loads and moving live loads distort the cables and produce a wave motion on the roadway. When the roadway is supported by a truss which is hung from the cable, the structure is called a stiffened suspension bridge. The stiffening truss distributes the concentrated live loads over a considerable length of the cable. Modern movable bridges are either bascule, vertical lift, or swing; with few exceptions, they span waterways. They are said to be closed when set for the traffic they carry, and open when set to permit traffic to pass through the waterway they cross. Bascule and swing bridges provide unlimited vertical clearance in the open position. The vertical clearance of a lift bridge is limited by its design. The bascule bridge consists primarily of a cantilever span, which may be either a truss or a plate girder, extending across the channel. Bascule bridges rotate about a horizontal axis parallel with the waterway. The portion of the bridge on the land side of the axis, carrying a counterweight to ease the mechanical effort of moving the bridge, drops downward, while the forward part of the leaf opens up over the channel much like the action of a playground seesaw. Bascule bridges may be either single-leaf, where rotation of the entire leaf over the waterway is about one axis on one side of the waterway, or double-leaf, where the leaves over the waterway rotate about two axes on opposite sides of the waterway. The vertical-lift bridge has a span similar to that of a fixed bridge and is lifted by steel ropes running over large sheaves at the tops of its towers to the counterweights, which fall as the lift span rises and rise as it falls. If the bridge is operated by machinery on each tower, it is known as a tower drive. If it is driven by machinery located on the lift span, it is known as a span drive. Swing bridges revolve about a vertical axis on a pier, called the pivot pier, in the waterway. There are three general classes of swing bridges: the rim-bearing, the center-bearing, and the combined rim-bearing and center-bearing. Rim-bearing bridges are supported on circular girder drums on rollers, center-bearing on a single large bearing at the center of rotation. Bridge substructure consists of those elements that support the trusses, girders, stringers, floor beams, and decks of the bridge superstructure. Piers and abutments are the primary bridge substructure elements. Other types of substructure, such as skewbacks for arch bridges, pile bents for trestles, and various forms of support wall, are also commonly used for specific applications. The strengthening of concrete bridges is generally achieved by replacing the damaged material, incorporating additional structural members, as in external prestressing, or increasing the size and capacity of existing members. Numerous repair techniques have evolved for concrete members in both bridges and buildings for replacing damaged concrete, repairing cracks, and repairing corroded reinforced steel bars. Steel bridges are most often strengthened by the addition of new steel members or smaller elements. Steel welding and bolting are well-developed techniques for steel connections. Thus, strengthening of steel bridges is perhaps more defined than for the concrete bridges. Techniques for repairing steel bridge elements include flame straightening, hot mechanical straightening, cold mechanical straightening, welding, bolting, partial replacement and complete replacement. 1. A structure that spans a depression or provides a passage between two points which are at a height above the ground affording a passage for pedestrians, vehicles, etc. 2. At a demolition or construction site, a scaffold built over the adjacent sidewalk to protect pedestrians and motor vehicles from falling material or debris. 3. In the backstage of a theater, a platform or gallery (of fixed or adjustable height), over or alongside the stage; used by scene painters (see paint bridge), lighting operators (see light bridge), and stagehands. There are many meanings that you could give to this symbol. The details in the dream are just as important as the bridge itself. The first consideration should be given to how much you travel. The bridge can be interpreted literally if it is a part of your daily commute. On a more theoretical level, bridges can symbolize transitions (e. g., transition from one stage to another, from one level of consciousness to another). Since most bridges are over water (i. e., emotions, unconscious), this dream could also be symbolic of your rising above your emotional difficulties or unconscious drives. United by a spiritual bond, undiscovered and unsuspected by us in the flesh, did we two, who had met as strangers on the fatal bridge, know each other again in the trance? He flushed, hesitated a moment, and then, saluting, turned upon his heel and left the bridge. The crew, with the exception of those whose duties kept them below, were ranged on deck below the bridge. I was not long in ascertaining a possible explanation of my depression, for, though we were plainly visible from the bridge of the aero-submarine and to the hundreds of men who swarmed her deck, the ship passed directly above us, not five hundred feet from the water, and sped directly westward. Not only did the bridge go down crowded with human beings, but the impetuosity of that flood of men toward the fatal bank was so furious that a mass of humanity poured itself violently into the river like an avalanche. Then the major and the grenadier, the general and his wife, remained almost alone on the river bank, a few steps from the spot where the bridge had been. Marechal Victor, when he started, about nine at night, from the heights of Studzianka, which he had defended, as the rear-guard of the retreating army, during the whole day of November 28th, 1812, left a thousand men behind him, with orders to protect to the last possible moment whichever of the two bridges across the Beresina might still exist. The owl-man led him back down the mountain path and ordered the scarlet alligator to crawl away and allow the Nome to cross the bridge in safety. They were all on the bridge when the real force of the hurricane struck the ship.